Our goal is to improve the effectiveness of health promotion programs provided to people in the United States and the world by applying what we have learned from research and practice to improve outcomes. We do this in workplace, clinical and commercial spheres through consulting, collaborations, public speaking, and conferences. Focusing our work on this goal will help us achieve our underlying vision of enhancing health by helping people improve lifestyle practices that prevent disease and enhance quality of life, and make the organizations they serve more effective. We are committed to sharing resources at no cost whenever possible. 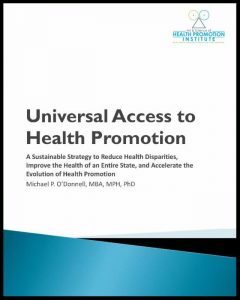 This includes sharing electronic versions of Health Promotion in the Workplace reference text and other books authored by Dr. Michael O’Donnell, as well as videos of his presentations. For those choosing the free PDF or Kindle option, we will encourage them to Pay It Forward by helping someone else with an unexpected kindness, and give them the option of telling us how they plan to do so. Helping employers launch new programs that enhance health and advance organization goals, evaluate the impact of their existing programs, and refocus programs to achieve better outcomes. Helping providers improve the scientific validity and effective implementation of their services. Helping hospitals integrate health promotion concepts into patient care, staff and employee benefits, and community outreach. Forming international collaborations that advance policy and practice and stimulate cross cultural learnings. Three core principles guide our work: The Awareness, Motivation, Skills and Opportunity Framework (AMSO); the Renewing Health Behavior Change Process and an Aspirational View of Health. Collectively these three concepts make up what we call the Face of Wellness. In our logo, the pyramid represents the AMSO Framework, and the two circles represent the Health Behavior Change Process and the Aspirational View of Health. Recognizes that lifestyle change can be facilitated through a combination of learning experiences that enhance awareness, increase motivation, and build skills and, most importantly, through the creation of opportunities that open access to environments that make positive health practices the easiest choice. Recognizes that lifestyle change rarely happens all at once and can be stimulated through a gradual growth process that helps people open their heart and mind to change, measure their health status, set goals, build new skills, form habits, help others, and be open to repeating that process. Recognizes that physical health, is not the top priority for many people and achieving a high level of physical health may not be a strong motivator for some people to focus on practicing healthy lifestyle. Achieving high levels of other dimensions of health, including Emotional, Social, Spiritual or Intellectual may be more important drivers. Our signature event is the annual Art and Science of Health Promotion Conference. The Conference was established in 1989 with the goal of narrowing the gap between research and practice by stimulating dialogue and engendering lasting relationships between practitioners and scientists and exposing them to thought leaders from corporate, clinical, educational, policy and entrepreneurial spheres. Launched in 1986, the American Journal of Health Promotion, was the first peer-reviewed research journal devoted exclusively to health promotion. It now has subscribers in more than 40 countries and one of the highest citation impact factor ratings in public health, and was acquired by Sage Publications in 2016. The first edition, published in 1983, was the first reference text to illustrate how management principles could be applied to enhancing workplace health promotion programs; updated editions have been in continuous publication for 34 years, translated into Chinese, Japanese, and Portuguese, and remain as the most widely used reference and textbook in the field. The 700+ 5th edition was released in March 2017. PDF versions of the text are available at no charge to members of qualified organizations and the Kindle version at nominal charge. The print version is currently available at normal retail prices. In 2000, Dr. O’Donnell, our CEO, launched a non-profit policy group, eventually called Health Promotion Advocates, with the goal of integrating health promotion concepts into national health policy. We engaged more than 2,400 health professionals and dozens of major advocacy groups to help us write and introduce three pieces of legislation in the United States Senate and House of Representatives. Several major provisions in these bills have become law, including grants to small business for comprehensive wellness programs and creation of a cabinet level Council that released the first ever National Prevention Strategy on June 16, 2011. Michael P. O’Donnell (2009) Definition of Health Promotion 2.0: Embracing Passion, Enhancing Motivation, Recognizing Dynamic Balance, and Creating Opportunities. American Journal of Health Promotion: September/October 2009, Vol. 24, No. 1, pp. iv-iv, updated from Michael P. O’Donnell (1986), Definition of Health Promotion, American Journal of Health Promotion, June 1986; vol. 1, 1: pp. 4-5.